There are three Windham brides, but Charlotte Windham is uninterested in making a fourth. As the “sole remaining marital project” among the Windhams, she is weary of countering the efforts of her family to find a match for her and even wearier of dodging hopeful suitors eager to claim the hand of a Windham. She has also had a surfeit if the jealous gossip that surrounds her. Lucas Sherbourne’s proposal catches her by surprise, but his osculatory expertise almost convinces her that marriage to him might be worth the sacrifice of her freedom. But Charlotte has a cause dear to her heart, and marriage would mean losing her freedom to spend her time and her funds as she wishes. Consequently, Charlotte determines to say no to the eminently kissable Mr. Sherbourne, but a farewell kiss interrupted by the Duke and Duchess of Moreland changes her plans. A week after Charlotte and Lucas are discovered in that farewell kiss, they are married by special license in the Moreland formal parlor with only six members of the Windham family present—Charlotte’s uncle and aunt (the Duke and Duchess of Moreland), the duke’s heir Westhaven and his countess, and the duke’s eldest daughter Maggie and her husband, the Earl of Hazelton. Immediately after the wedding, the newlyweds leave for Sherbourne’s home in Wales, and their real adventure begins as they come to know each other and discover an unexpected compatibility that encompasses, but is not limited to, the chemistry that made that “farewell kiss” necessary. Burrowes skillfully weaves the threads of Charlotte’s cause and its highly personal genesis and Sherbourne’s colliery into the story of their marriage. Grace Burrowes is a wonderful storyteller with a particular gift for creating characters who fully engage her readers, but Charlotte and Sherbourne are special even for Burrowes. 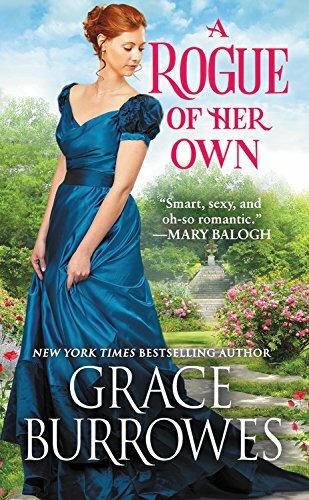 Their story held great promise in No Other Duke Will Do, and it exceeded even my high expectations in A Rogue of Her Own. I loved this book! A Rogue of Her Own is the conclusion to The Windham Brides, a series within the larger Windham series. I think it is the best in an excellent quartet. If I tell you that upon finishing this book, I went back to The Heir, Burrowes’s debut novel and the first Windham book, and then reread the full series, twelve novels (including the four Windham Brides books) and four novellas, and enjoyed every story as much as I did the first time I read them, you may understand what a delight I found this last book to be. In fact, a second reading kicked my rating from a 4.5 to a full five stars. If you like historical romance that blends a little sizzle, more than a little laughter, and some substantive issues with a love story that is as much about genuine liking, understanding, and appreciation as it is about lust, I think you will fall in love with this book too. I highly recommend it. And I’m keeping my fingers crossed that Burrowes has more stories of the Windhams in store for her readers. My favorite historical author!!!! I enjoy all her stories! I love her books, and have this on my "wish list". I have enjoyed her stories and this one sounds delightful. Thanks for the rec, Janga. I have a list of all the books in this series (I think you helped me compile it! LOL). I just have to find the time to get through it. I read No Other Duke Will Do, my first book of hers, so naturally I want to see Charlotte and Sherbourne's story!! I didn't know there were so many in this series? This is a book which sounds perfect for me. I like stories where the newlyweds learn about one another. And the advice which you quote from Maggie sounds absolutely perfect. Thanks for the review. I will add this book to my want to have it list. I absolutely LOVE Burrowes!!! I just recommended her today to an online book buddy. To me, she has a very distinct/unique writing style that I can’t describe but love so much. The original Windham series was my introduction to her writing, and they rival the Bridgertons and the Everseas/Redmonds in my heart. I am drawn to family series...that connectedness is so interesting to me! I have this one (she’s an auto buy for me), but haven’t got to it yet....can’t wait!!! This sounds like another delightful read from Grace Burrowes. Watching their relationship grow and develop will be enjoyable. I love the cover. It is elegant, understated, and lovely.